Learn about the spring holidays that precede Easter: Mardi Gras (Carnival / FastNacht) and Lent. 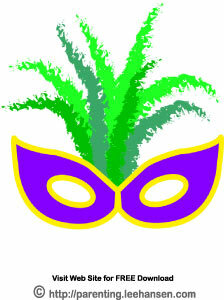 Mardi Gras Party Shop - Funky Costumes, Decorations, Beads, Masks! Mardi Gras season begins on the 12th day of Christmas - January 6, but the final day of partying is always 47 days before Easter, on the day before the start of Lent, or Ash Wednesday. This famous and ancient holiday is also known as "Fat Tuesday." On Fat Tuesday, Christians end their partying; the next day is Ash Wednesday, the first day of a 46 day fast that lasts until Easter. In Europe and other nations around the world, the season is also known as Carnival (Carnivale, Karneval). In New Orleans, Lousiana (USA) the most famous of Mardi Gras (literally "Fat Tuesday) celebrations takes place every year - with parties, festivities, merriment and parades that push the limits of propriety on everything from food and drink to attire and frivolity. Many people plan a Mardi Gras party during the month of February or March to coincide with Fat Tuesday celebrations or Carnival. In Pennsylvania-German culture, Fastnacht Day is a day to feast on doughnuts. It's celebrated on Shrove Tuesday, or Fat Tuesday - the day before Lent begins. Fat Tuesday is the day when people eat many many "FastNachts" - special Fast Night potato doughnuts without holes - in preparation for Lent when these foods are typically given up until Easter. Historically, Pennsylvania Germans would use up all the fat and sugar they had on hand before the Lenten fast by making these yeast-raised potato doughnuts and eating them with syrup. YUM! Mardi Gras celebrants party in costume - masquerade balls and parades are a major part of the holiday - wearing traditional/official Mardi Gras colors of purple, green, and gold, to represent justice, faith, and power respectively. Bead necklaces, feathers, and shiny fabrics are hallmarks of Mardi Gras holiday costumes. Lenten season is the name given to the 40 days in Spring that immediately precede Easter Sunday. Lent begins on Ash Wednesday, the day after "Fat" Tuesday which marks the final day of revels and carnival or Mardi Gras before Lent. Lent originated in the earliest days of Christianity. The 40 days of Lent symbolize Jesus' wandering in the wilderness for 40 days. For Christians today, Lent is a season for reflection and repentance. It's a time when we contemplate our lives and the direction we're going in our spirituality. On Ash Wednesday, the day that many churchgoers attend mass or services where as part of the ritual, ashes created by burning the previous Easter palm fronds are placed on the forehead. Easter marks the end of the Lenten season. Christians celebrate the story of the Resurrection of Christ and rejoice in the rebirth of the world after a long winter and 40 days of penance.